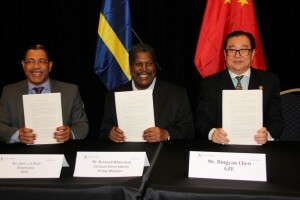 WILLEMSTAD – The Chinese company Guangdong Zhenrong has 28 days to demonstrate that they have sufficient financial resources to take over the oil refinery in Curaçao and to modernise it. This is one of the clauses in the Heads of Agreement that was signed last Saturday. On December 17, Guangdong Zhenrong must hand over a letter of guarantee from a bank to prove that the company has its financial affairs in order. More promises are made in the Heads of Agreement. A first complete draft of the technical plan for the oil refinery must be presented before April 30 next year. There must also be a plan for the oil terminal at Bullenbaai. Guangdong Zhenrong wants to invest billions in the refinery. The Chinese company also wants to create 1200 jobs for the local market.